It seems Bird made a coaching change just for the sake of change. He appears frustrated that the Pacers fell to mediocrity so quickly after challenging for a spot in the NBA Finals. 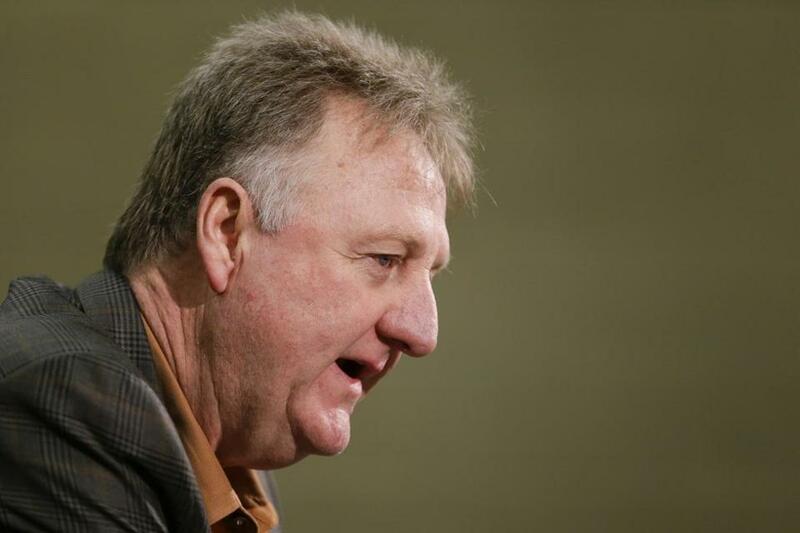 Larry Bird declined to extend the contract of Pacers coach Frank Vogel. During his press conference last week to announce that he hadn’t fired coach Frank Vogel but elected not to extend his contract, Larry Bird tried to elicit sympathy. He lamented this part of his job as president of the Pacers. Yet he removed one of the league’s finer young coaches, one who pushed a talent-deficient team to the verge of the Eastern Conference semifinals. Bird is trying to reshape his franchise back into a contender. Just a few years ago, the Pacers were pushing the mighty Heat in the Eastern Conference finals. Then Paul George broke his leg in a USA Basketball exhibition, and the organization’s progress was derailed. 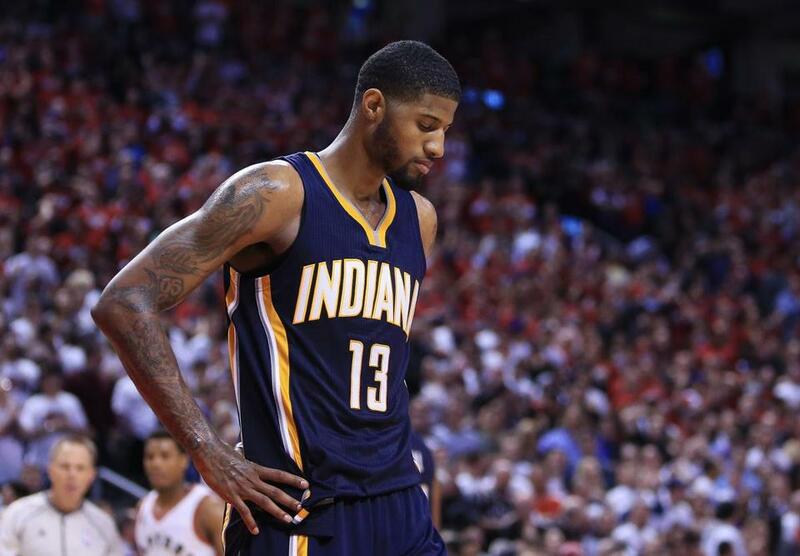 Last season, with George making a two-week cameo at the end, the Pacers missed the playoffs. This season, with a healthy George but without any major upgrades, the Pacers won 45 games and earned the seventh seed. They were eliminated by the Raptors in the first round in seven games. That wasn’t satisfactory for Bird, especially after scoring just 84 points in Game 7. He blamed Vogel’s mid-tempo system and then intimated that Vogel’s voice had worn on the players. Bird used his Celtics history as a reference. “I don’t know about [Vogel] losing the locker room, I wouldn’t go that far,” Bird said. “My experience has been good coaches leave after three years. I played for Bill Fitch and I’ve seen it happen firsthand. I talked to Red Auerbach on the subject a lot. We had K.C. Jones for five years, nicest man I’ve ever met, and they let him go and we were having success. “If you look around the league, there are guys that are being dismissed and you always wonder why, if you’re there every day and see things that are going on. Besides George, the Pacers’ roster is a lot like the Celtics’. They lack a true second option. George averaged 23.1 points this season in 81 games. Monta Ellis, the Pacers’ second-leading scorer, averaged 13.8 in 81 games. Paul George averaged 23.1 points per game this season. The rest of the Pacers’ starting lineup would not start for a championship-caliber team. Last season, the Pacers ranked 23rd in the league with an offensive rating of 103.5 (points per 100 possessions). Bird then traded ineffective and declining center Roy Hibbert to help create a faster-paced team, but this season Indiana ranked 25th with an offensive rating of 104.6. “We’ve got some good players and two guys who are really good players,” Bird said. “I think the franchise is in a good position. If you win 45 games, I expected us to win more this year. I expect to be in the playoffs and make it through a few rounds and see how good our players really are. Bird said Vogel’s 5½-year tenure was long enough and new leadership was required. But the key for the franchise is attracting a major free agent to join George. It was Bird who signed Ellis, Rodney Stuckey, and George Hill to long-term contracts. The Pacers have enough money for a major addition, but Indianapolis has never been an attractive destination for free agents. The next challenge for Bird is to hire the right coach to play the uptempo style he desires and to use his clout to sign players who can flourish in that style. The Pacers have scored big in the draft with George, Myles Turner, and Solomon Hill, but free agency is where Bird will have to really score. He realizes his decision to remove Vogel was unpopular, but there will be a long list of candidates — such as Mark Jackson, Nate McMillan, and Mike D’Antoni — for the position. Bird is banking on his belief that a coaching change will jump-start a franchise that has taken lateral steps. Just as the Celtics are learning, the step from competitive to contender is the most difficult one to take. 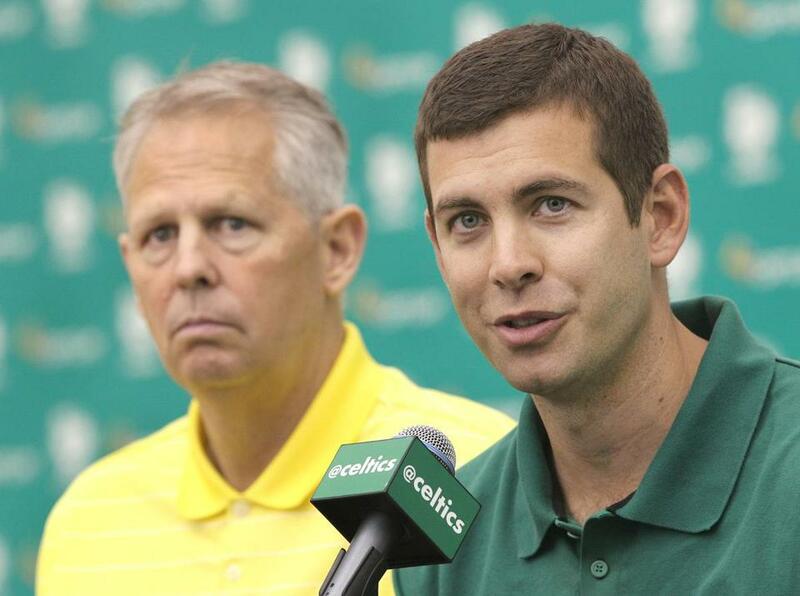 ‘He has done a magnificent job,’ Danny Ainge said recently of Brad Stevens. President of basketball operations Danny Ainge last week professed his adulation for coach Brad Stevens and touched on the Celtics’ chances of landing a marquee free agent. Stevens just finished the third year of a six-year contract and may receive an extension soon considering the rising salaries among head coaches. Scott Brooks reportedly received $7 million per season to lead the Wizards, while Luke Walton signed a deal worth $5 million per season. Stevens earns an average of $3.66 million per season. “He has done a magnificent job,” Ainge said of Stevens. “I think we’ve seen the development of a lot of our young guys, especially Avery [Bradley] and Marcus [Smart] have really developed. We saw Terry [Rozier] late in the year, and we saw some things he can do. There’s a lot more he can do. Stevens has led the Celtics to the postseason each of the last two years and is considered one of the bright young coaching minds in the NBA. Perhaps the most difficult task of Ainge’s tenure will be to convince a premium free agent to sign with the Celtics. With every team having approximately an additional $20 million for their budgets and Boston being a difficult sell to free agents, the challenge of upgrading the Celtics roster will be arduous. Ainge has had to be creative to upgrade the roster, such as nine years ago when he struck trades for Kevin Garnett and Ray Allen to create the second Big Three. 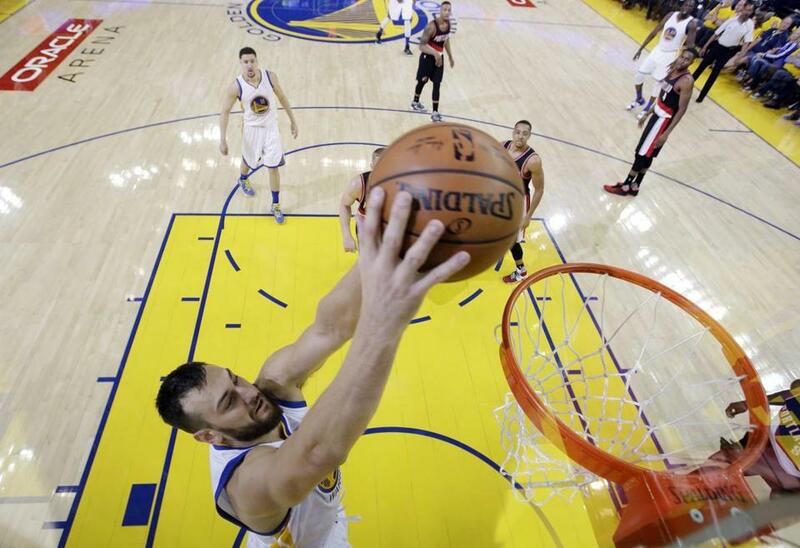 Andrew Bogut has averaged 5.4 points per game this season. Andrew Bogut was the No. 1 pick in the 2005 draft and was considered a franchise cornerstone with the Bucks until suffering an ugly elbow injury six years ago. In March of 2012, Bogut was part of a trade that changed the Warriors franchise. He was sent to Golden State along with Stephen Jackson for Monta Ellis, Ekpe Udoh, and Kwame Brown. That deal allowed Stephen Curry to play point guard full time, without the interference of Ellis, who was a combo guard like Curry. Bogut’s role changed with the Warriors. He was no longer needed to score. He was more useful for his defense and rebounding. Bogut averaged 15.9 points per game in 2009-10 with the Bucks, but just 5.4 this season. At 31, Bogut speaks as an NBA sage. He has won an NBA title and may be on his way to another. He embraces having to sacrifice for the greater good. Bogut was asked about teammate Harrison Barnes, a fourth-year forward who is averaging just 8.5 field goals per game in his career as he plays a complementary role to Curry and Klay Thompson. “We’re winning. A lot of guys are sacrificing numbers and minutes and roles on this team and that’s why we’re a great team,” Bogut said. “Harrison has had great games, has had bad games just like anybody else on this roster. So I don’t anticipate it affecting his contract situation. Those secondary players have helped the Warriors survive Curry’s injury absence in the playoffs. “Guys like [Andre] Iguodala, [Marreese] Speights, and Festus [Ezeli], all these guys could probably make more on other teams,” Bogut said. “[Speights] has been huge for us. He had points like this for us last season as well. A lot of people forget the guys on this team, but Mo’s probably had his best month that I’ve seen in a Warrior jersey. He’s knocking down shots and shooting the 3-ball at an outstanding rate. He’s been big for us in defense and rebounding, so if he does that for us it’s very, very tough to beat and we love it when he gets going because it takes so much pressure off the starting unit. The Warriors rolled through the selfish Rockets in five games in the first round. The Rockets spent the season fighting over shot attempts and bickering over defensive assignments. It was an embarrassing sight and a testament to a talented team that had no chemistry. A look at Bogut's per game averages over the course of his career. Golden State is the antithesis of Houston. The Warriors have been successful because players such as Iguodala, Barnes, and Livingston have sacrificed bigger roles with other teams to mesh for a championship. Has the NBA become more selfish over the past decade? Bogut believes so. “That’s the problem with the league today. It’s ‘I want to win but I need my 30 shots to win.’ Theoretically, you probably need 10 and need to get other guys going to have a chance to win,” he said. “Not many guys are willing to do that. We have two absolute bona fide scorers in Klay and Steph that are willing to do that. They are willing to give up the open shot, willing to pass, willing to make the right play. That’s the reason why we’re successful. Only a handful can do it. You have to have a strong-minded coach that can reiterate that every day, you have to have a strong GM, strong ownership group that are on the same page. Bogut remains a capable center despite his physical limitations. Eleven NBA seasons have been difficult on his body, but coach Steve Kerr has limited Bogut’s minutes to make him a more effective player. “I haven’t been playing a lot of minutes. I’ve been averaging 20-odd minutes and that helps,” he said. “If I had been playing 30, 35, it might be a bit of an issue on the legs. But I feel good at this point in the season, nothing is really bothering me. 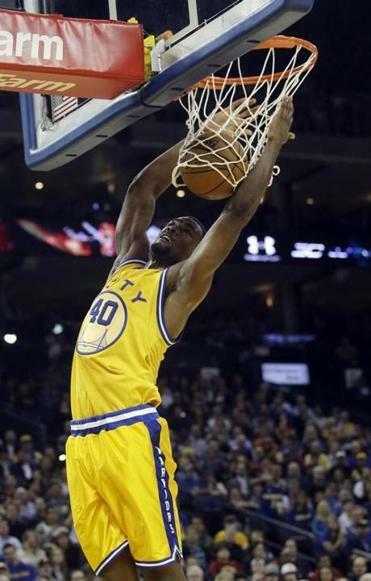 Harrison Barnes will become a restricted free agent this summer. The Warriors could be a dramatically different team next season. They might decide to pursue Kevin Durant in free agency. They have eight players who are restricted or unrestricted free agents this summer. Among the restricted FAs are Harrison Barnes, who may garner a maximum offer with the increased salary cap, and center Festus Ezeli, a valuable defender who is improving but injury-prone. As for the unrestricted FAs, Marreese Speights may garner the most interest from other clubs. Speights is known for his scoring prowess but had a disappointing season following a sparkling 2014-15 . . . Top draft prospect Brandon Ingram has decided to participate in the NBA Pre-Draft Combine, but that may just mean the measurement portion of the session and not the five-on-five workout. Ben Simmons is not on the list of scheduled participants, but other projected top-10 picks such as Oklahoma’s Buddy Hield, Cal’s Jaylen Brown, Kentucky’s Jamal Murray, and Marquette’s Henry Ellenson are on the list. Early-entry candidates have until May 25 to return to school. The combine begins May 11 . . . The Heat and Chris Bosh released a joint statement declaring the All-Star out for the remainder of the postseason, and his future could be cloudy because of the blood-clot disorder that returned during the All-Star break in Toronto. Bosh has wanted to return to the court, but the Heat refused to clear him. Miami does not want to risk playing Bosh when he is experiencing a potential life-threatening condition. Bosh believes he can play using blood thinners, but finally relented on his request to return. It is uncertain whether Bosh will be ready for training camp in October. Bosh will have to prove during the summer that he is able to play following blood-thinning treatment. The situation is precarious.